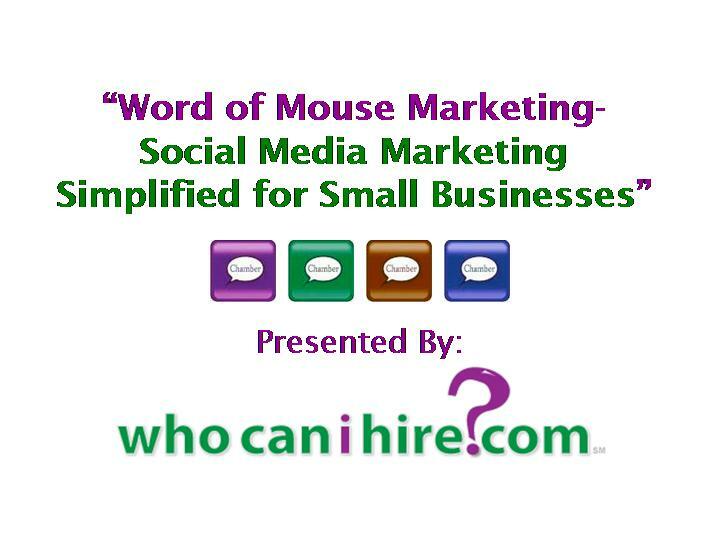 Announcing "Word Of Mouse Marketing - Social Media Marketing Simplified for Small Business"
HOW MUCH: Nothing but ONLY if you RSVP with the link in this email, otherwise $10. Why pay? RSVP right now. 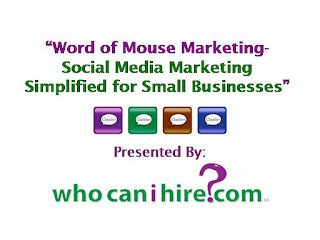 • 3:30 pm - 4:00 pm: "Effective Web Site Design - Let Your Work Speak For Itself" - SPEAKER: Sahim Zaid, Zaid Designs. • 4:00 pm - 4:30 pm: "How to Increase Sales in a Down Economy: Simple Yet Little Known Techniques to Make More Money", SPEAKER: Milton Olave, Nexgen Training and Coaching. • 4:30 pm - 5:00 pm: "Financial Options for Business Owners", SPEAKER: Josh Kaplan, Space Coast Credit Union. • 5:30 pm - 6:00 pm: "How to Utilize Barter to Increase Sales and Maximize Profits in Today's Economy", SPEAKER: Ted Stawicki, Barterr, Inc.
• 6:00 pm - 6:30 pm: "How to Boost Sales Through Creative Problem Solving", SPEAKER: Rafi Benamoz, Benamoz Inc.
• 6:30 pm - 7:00 pm: "How to Turn an Idea Into a Business in 1 Day", SPEAKER: Vince G, Startup Business Boot Camp. • 7:00 pm - 7:30 pm: "Making Money in Real Estate in 2012", SPEAKER: Matthew Soroka, Capital Group REIA. • 7:30 pm - 8:00 pm: "How to Find Missing and Commonly Overlooked Tax Deductions for You and Your Business", SPEAKER: Beatriz De La Rua, Froehlich & De La Rua CPA Firm, LLC. Attend some or all, but be sure to check out the exhibitors at the EXPO while you're there!